"Growing up, my life was turbulent and I found myself with a series of bad decisions which led to homelessness and drug abuse. I just sort of did what I wanted and I got into a lot of trouble along the way ... when I found out I was going to be a father, I knew I needed to do something." Kevin came to Unity House of Troy and used the services of United Way's Family and Neighborhood Resource Center located there. He received counseling, referrals for food and shelter and help overcoming his addictions. "I had been leaning on others for so long, living in shelters and spending time on people's couches, so that when I got my first apartment, I just lay on the floor for 72 hours," Kevin said. "After not being able to make choices in your life, to get that freedom back is a great feeling." Today, Kevin lives in a well-kept apartment in South Troy. He says with pride "This is the longest I've ever lived in one place." 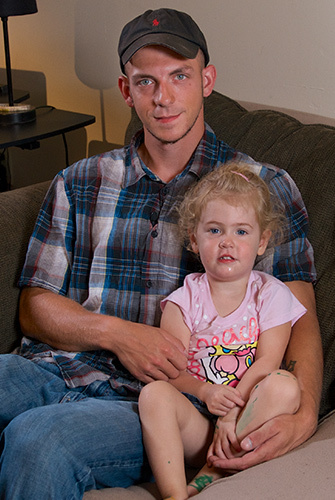 He gained custody of his daughter and is studying for a career in human services. He shared,"If at the end of my life, people look back and say I was a good father, that's enough." United Way Family and Neighborhood Resource Centers are one-stop locations where families have access to a network of services including pre-natal parent education, early learning tools, budgeting assistance, prevention programs and much more. Kevin said that the key to his recovery was his ability to get referrals and assistance at one location, from one case manager, without having to travel from program to program. "If at the end of my life, people look back and say I was a good father, that's enough."